Treyci and Brandon's engagement session actually happened the weekend after the Greenville, SC wedding. During their Asheville honeymoon, we set up a day for me to drive up and meet them for their session. Since it happens after their wedding, I call it an Afterglow Session. We spent most of the day on the periodically rainy grounds, listening to Treyci, a profession and fabulous singer, serenade her new husband Brandon. And her voice ringing off the surroundings was as delicious as was their love story. In the afternoon, near sunset, the clouds broke and we spent time in the vine-covered pergola. 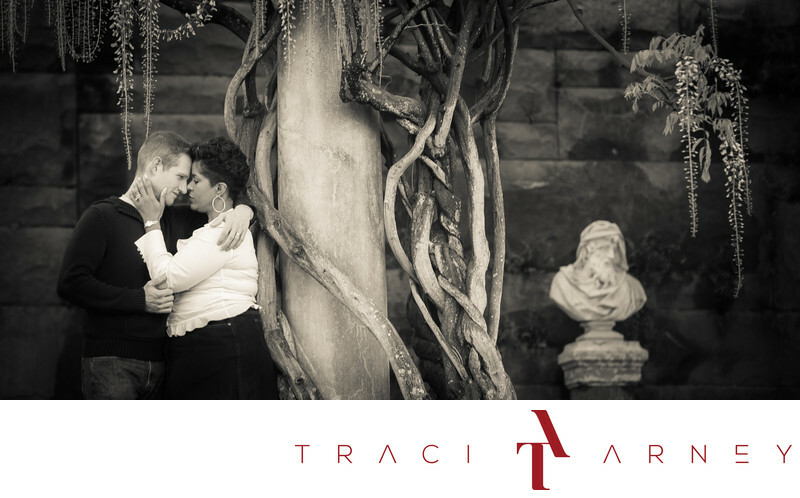 With the white sculptures shining in the darkness of the pergola, Treyci and Brandon were the perfect counterpoint to this background. I chose black and white for this image because the color image was actually marred by the colors and was distracting. I shoot at The Biltmore Estate a great deal and I am always game to go back. There are so many backgrounds, venues, and photographic options there. Plus, with Asheville just outside the gates, the photographic world is our oyster! Keywords: Afterglow Session (9), Asheville NC (3), Biltmore Estate (6), Biltmore House (3), Black and White (135), Brandon (3), Bride (171), Destination (6), Engagement Session (138), garden (3), Groom (72), Outdoor (78), pergola (6), Treyci (3). 1/100; f/3.2; ISO 160; 145.0 mm.